Camp Syncro is a unique safari camp for individualists, situated right on the banks of the Kunene river at the end of the Marienfluss valley. It can be reached only by 4x4 vehicle within a day's drive from either Opuwo or Sesfontein. It is the only camp in that region. 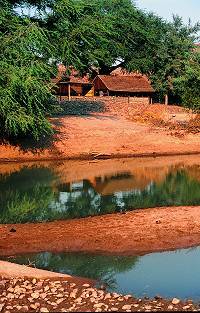 The bungalows are built from river stones and covered with thatched roofs. Peacefully secluded, they are set under big Ana t rees. A unique atmosphere is created by the subtle background rush of the river, the recurrent clacking of cattle and goat hooves on the pebble stones and the warbling of the mourning dove in the trees. Camp Syncro is mainly powered by solar energy. Bungalows are designed to be comfortable and functional. Each of the four huts is equipped with its own water fountain and two beds, which allows for a maximum of eight guests. Two separate showers and two toilets warrant the necessary privacy. It is advisable to spend at least two, better three nights at the camp in order to fully benefit from the various aspects of daily programs offered. Your host gained intimate and extensive knowledge of the area and its inhabitants. You will be able to take advantage of his in-depth experience when meeting with the Ovahimba, driving or strolling through the side valleys of the Marienfluss or taking a bath in a natural whirlpool next to the rapids. In the last few years Camp Syncro has become a popular stop-over for self-drive visitors. The camp can also be the destination of a 3-day fly-in safari or point of departure for a Kaokohimba Safaris. It is not recommended to drive from Opuwo to Camp Syncro in one day. Although it is "only" about 300 kilometres the road conditions are often bad and it takes easily between 8 to 11 hours driving time. Possible overnight stop to break your journey is in Onjuva - Marble Mine Camp. 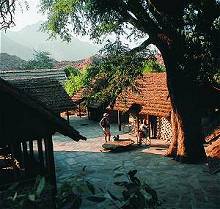 Facilities: thatched natural stone huts (maximum eight people), two separate showers/toilet, only one cohesive group is lodged at the time.